Hello everyone! I apologize for going MIA for two weeks, I was busy helping my friend, the one who was hit by a car. She is doing well and she’s at home with her family. She has a new brace that allows her to bend her knee and it helps her get around. This is not what this post is going to be about, though. The site goes on to discuss when Thanksgiving became an official holiday until almost 200 years later. That’s a long time but it has been changing since then, into what it is today. From what was eaten in 1621 to now and the reason is was celebrated vs. why we celebrate it today. They menu in 1621 did not include turkey or cranberry sauce nor did it have pies. Instead they had venison (deer), corn, fowl, and barley. Today, many households do have turkey, ham, cranberry sauce, potatoes (sweet and mashed), various pies, as well as other food choices. In 1621, the reason Thanksgiving was celebrated was because the pilgrims wanted to celebrate their first successful harvest in the Americas. They then decided to invite the Native Americans to join in the three day festivities. Today, however, we typically associate Thanksgiving as a day to spend with friends and family as well as think about all that we are thankful for. Every family has their own traditions, my family’s traditions are slightly different than my husband’s family’s traditions and I’m sure our future family traditions will combine both as well as new traditions. 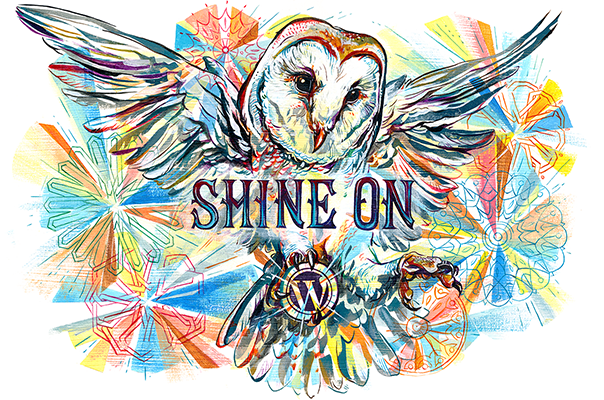 Traditions also differ depending on what area in the United States you live in. If you are in the south, you have more southern food but if you go further north or west, you get a different menu. What are your family traditions? What is your favorite thing to eat during the festivities? Comment below to share. Happy Thanksgiving from me to you! Enjoy your time with those you love. So, I know that it is Tuesday and I was supposed to post more about my life as a nanny but I got home late and had a horrific headache…more like a migraine, yuck! So, as I posted about last week, I am a nanny for 2 crazy little boys (ages 4 and 6). They definitely keep me on my toes. Thankfully yesterday they were very understanding about my head and were quite good. Most days they run around screaming and fighting. Yesterday there was much less of it. Perhaps it’s just that they finally realized that if they are bad, I tell their mom and then she gets to discipline them how she sees fit. The first couple of times I told their parents about their poor behavior, they boys cried and said that I wasn’t supposed to tell them. Anyway, that’s enough about that. Let me tell you more about my job. I work 4-5 days a week at various times. Yesterday I worked for over 12 hours (which I always hate because when they boys are in bed, I’m ready to go home). I always get Wednesdays off, after I finally asked for that day to always be off so that I could focus on school. You see, when I was first hired, I was hired to work Mondays, Tuesdays, and Thursdays. Then all of a sudden she wanted me to work Monday-Saturday. I finally got tired of it and got the courage to ask for Wednesdays off. I also don’t work every Friday and Saturday, which I am thankful for because I can’t handle those boys all the time. I have come home before and just cried because I was so overwhelmed with everything. Do you ever feel that way at work? It’s a horrible feeling. What is the “usual” routine, you ask? Well….there isn’t an actual “normal” routine because my hours are not usual. But at the beginning, the boys’ mom made a schedule to refer to when I needed to. They have breakfast about 8:oo am then the 6-year-old goes to school. I’m supposed to do about 30 minutes to an hour of “school work” for the 4-year-old (so he can be all ready for Kindergarten) while the 6-year-old is off at school. After the 6-year-old comes home they have lunch then have “quiet time” where they watch a little TV. After quiet time it is time to go to the park to burn some energy. It’s a nice little sandy park with 2 slides and a couple of other things. They love to take their beach toys and build sand castles. After the park we go back home, do a little more “school work” and the 6-year-old has to read at least one book (he always throws a fit because he hates reading…even if it’s 2 pages with a sentence on each). I let them play a little while I prepare dinner, then they are eating when I’m done. There is always some veggie on their plate with dinner (mom’s orders) and the 6-year-old cries because he hates veggies. After dinner is bath-time. The 4-year-old goes first then the 6-year-old. Never bathe them at the same time because they just fight about it and it’s just crazy. After bath time, they watch a movie and get into bed. At 8:00pm, lights are off and it’s time to sleep. They throw a fit because they hate going to bed and they want to be awake to see mommy. Last night the 4-year-old said I was a bully because I was making them go to bed…he usually says stuff kind of mean because he says it to the parents and they don’t correct it. That is my “typical” day as a nanny. Thanks for reading! For those who are nannies or work with children in any way, what do you do on a “typical” day? How do you help the children learn and grow? How would you deal with threats from a 4-year-old? Let me know your responses! 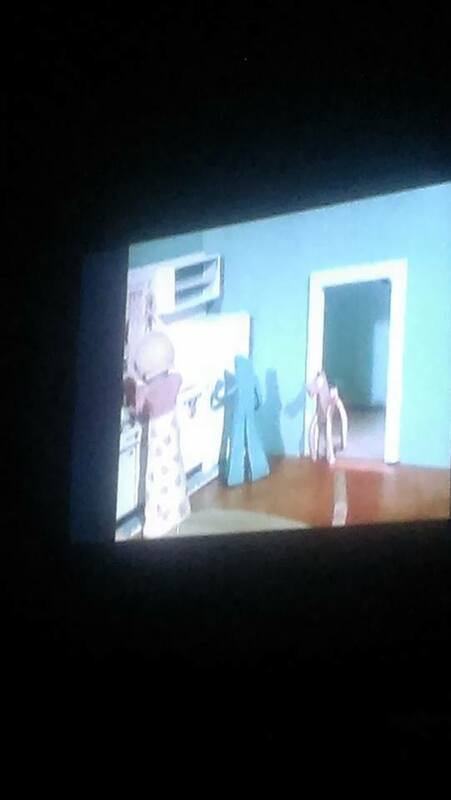 We watched Gumby before going to sleep this past week, the boys loved it! 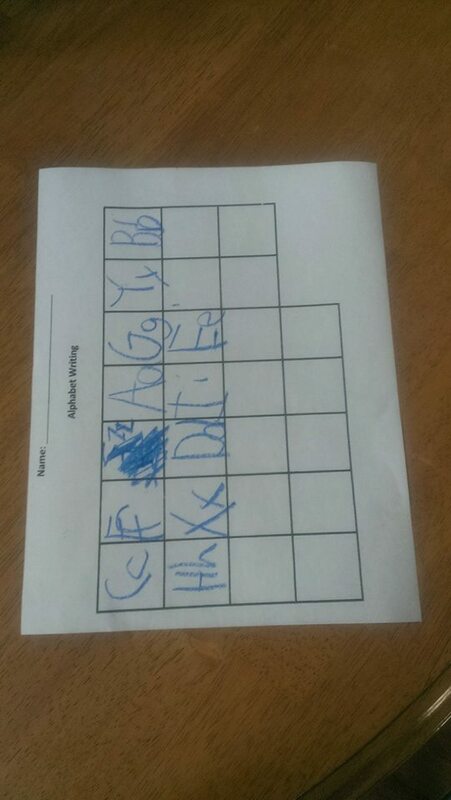 This is the 6-year-old practicing his alphabet. He messed up on the letter Z then cried for about an hour because he didn’t want his mom to see it. He believes she never makes any mistakes and he doesn’t want her to see that he messed up. I tried talking to him but it just made him more upset…it made me sad.